Clicking the Text & Language tab in your site settings will allow you to customise a large number of pre-defined text options that will be displayed to visitors in certain scenarios. If nothing is entered in a specific text box, the default content will be displayed to you in grey. Welcome Title - This is the initial welcome message displayed to the visitor when they first open the ChatBox. Welcome Text - This is the initial text displayed under the title when the visitor first opens the ChatBox. 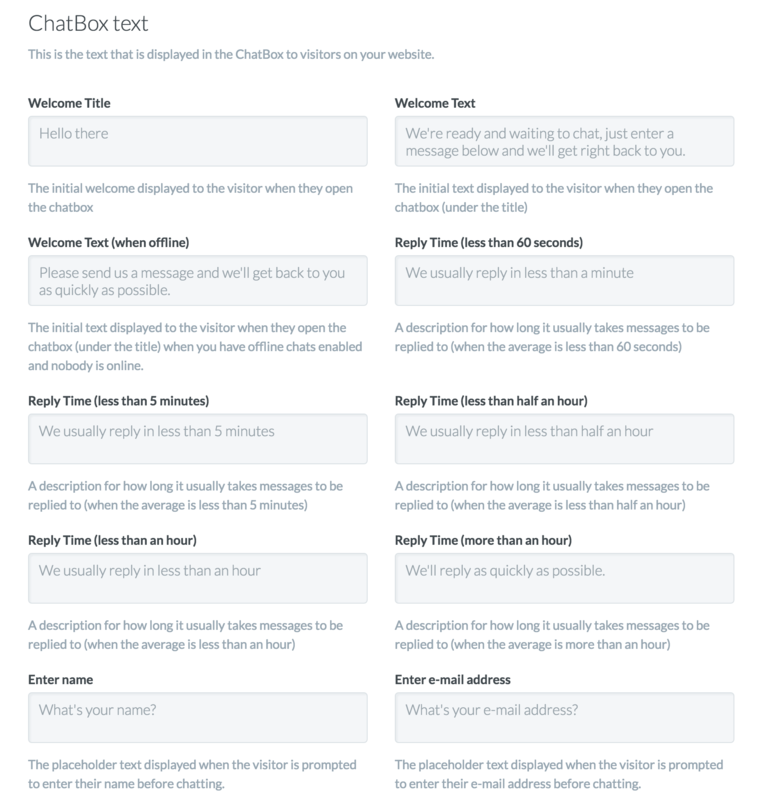 Welcome Text (when offline) - This is the initial text displayed under the title when the visitor first opens the ChatBox, if all agents are offline and offline chats are enabled for your site. Reply Time (less than 60 seconds) - A description of how long it usually takes messages to be replied to, when the average first response time is less than 60 seconds. Reply Time (less than 5 minutes) - A description of how long it usually takes messages to be replied to, when the average first response time is less than 5 minutes. Reply Time (less than half an hour) - A description of how long it usually takes messages to be replied to, when the average first response time is less than half an hour. Reply Time (less than an hour) - A description of how long it usually takes messages to be replied to, when the average first response time is less than 1 hour. Reply Time (more than an hour) - A description of how long it usually takes messages to be replied to, when the average first response time is more than 1 hour. Enter name - This text is displayed to the visitor as a prompt to enter their name before starting a chat. Enter e-mail address - This text is displayed to the visitor as a prompt to enter their e-mail address before starting a chat. Visitor details submit button - This is the text for the button displayed to the user to click and start a new chat. 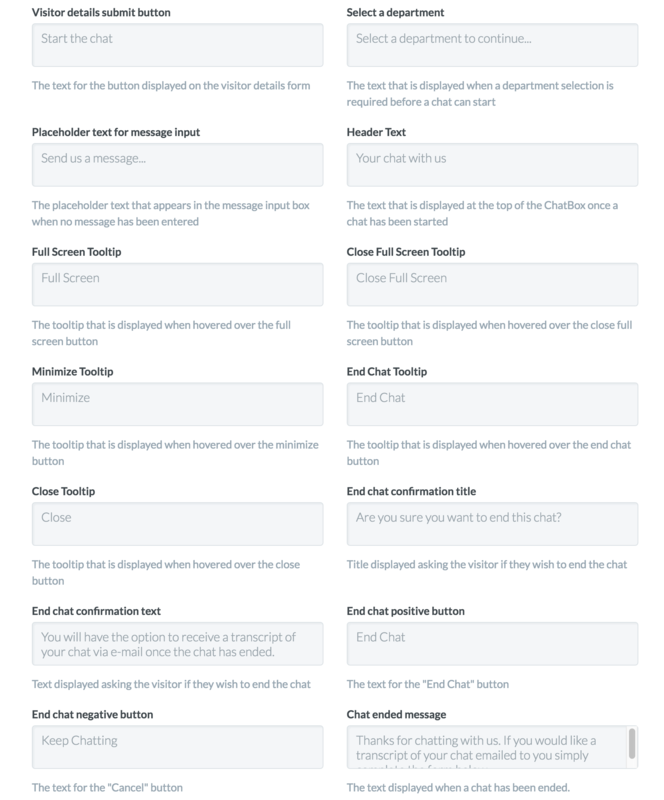 Select a department - This text will be displayed to choose a department if this is required to start a chat. Placeholder text for message input - This appears in the message input box when no message has been entered. Header Text - This text is displayed at the top of the ChatBox once a chat has been started. Full Screen Tooltip - This tooltip is displayed when the full screen button is hovered over. Close Full Screen Tooltip - This tooltip is displayed when the close full screen button is hovered over. Minimize Tooltip - This tooltip is displayed when the minimize button is hovered over. End Chat Tooltip - This tooltip is displayed when the end chat button is hovered over. Close Tooltip - This tooltip is displayed when the close button is hovered over. End chat confirmation title - This title is displayed to ask the visitor if they wish to end their chat. End chat confirmation text - This text is displayed below the title asking the visitor if they wish to end their chat. End chat positive button - This text is displayed on the end chat button. End chat negative button - This text is displayed on the cancel button. Chat ended message - This text is displayed to the visitor when their chat has been ended. Placeholder for e-mail address - This text is displayed to the visitor when their chat has been ended, prompting the user to enter an e-mail address to receive a transcript. Send transcript button - This text is displayed on the button to the visitor that prompts them to send a transcript to their entered e-mail address. Rating Question - This text is displayed to ask the user to rate a chat out of 5 stars. Rating Confirmation Text - This text is displayed after the visitor has rated a chat. Tray text - This text is displayed in the tray (or tooltip on badge style). 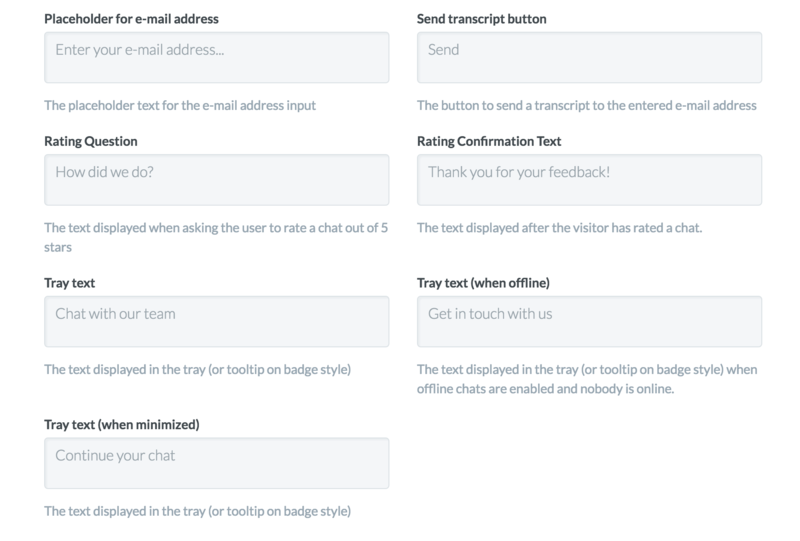 Tray text (when offline) - This text is displayed in the tray (or tooltip on badge style) when offline chats are enabled and nobody is online. Tray text (when minimized) - The text displayed in the tray (or tooltip on badge style) when it has been minimized.